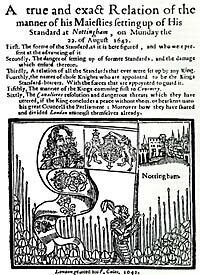 The Wargame Addict: King Charles raises his Standard at Nottingham Castle! Nice report. Looks great. I still make mistakes even know with games I should know off by heart lol! Great to see some of your marvellous ECW miniatures on the blog, Greg. Love the write-up too. No worries about rule errors - I think we all do those from time to time. It looks like the war has started with a fairly typical local action. Confusion and inexperience, combined with rash and unpredictable commanders sounds like a great combination to me. The Royalists were caught like the hazelnut between the nutcrackers, having commited most of their cavalry, then having flanking enemy forces on both flanks, and within striking distance was always going to be a hard combination to beat. The melees seemed to give the right results, although there are a lot of dice on the table, what was your first impression of the rules? Nice to see the terrain cards in use, this should develop into a most interesting campaign if that's the way you are going with it and I'm looking forward to seeing more. Cheers Dave, the young ensign in charge of the pikes had the sense to get 'em into 'close order' as soon as they marched onto the table - he seems a more level headed character than his opposite number! A most entertaining batrep, Greg. Learn from your mistakes and move on - that's what I do. Besides which, telling a good story is more important than sticking to the letter of the rules. Really pleased to have this opening encounter under my belt, and looking forward to playing some more Pikeman's Lament when I get (or make) the chance to do so - things are still a little chaotic here atm, but GRADUALLY returning to 'normal'. Despite the current lack of hobby time, I was determined to play this opening game on the anniversary date of the ECW "starting". Getting to grips with the rules didn't distract from the very good game report - go Parliament! Great AAR Greg! Personally, I'm a big big fan of mistakes :) Make them all the time and never learn from them lol! Looking forward to seeing more. That looked like a brilliant game. Love the Lion Rampant rules and been very tempted to put up an army for the English Civil war using Pikeman's Lament for a while. . . . Many thanks Mike, the rules share enough mechanics with the "Lion/Dragon Rampant" sets to make them really easy for anyone familiar with them to pick up, but enough tweaks to stand them apart and give them a nice period feel. Great for representing large skirmish / small battles, and I'd highly recommend them! Many thanks for your sub and sorry for my (very) late reply.